Nancy Thorn is a founding and current member of the Preservation Artisans Guild Board, as well as participating member of the Guild. Gilding since 1974, Nancy founded her company Gold Leaf Restoration in 1980. Nancy initially discovered gilding through a student who had studied the craft in the 1930s under Yale professor, Daniel Thompson Jr. Soon after, Nancy trained for a number of years under two of the east coast United State’s foremost gilders, Boston’s Nils Johnson and Connecticut’s Bill Keck. Now a master gilder, Nancy Thorn works on a wide variety of projects, from immense sculptures and statues to a beloved family heirloom in need of careful restoration. 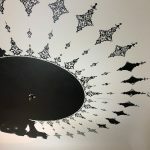 Nancy took the time to share some beautiful photos of a recent project along with a few thoughts on why she loves her work and what she values most about being involved in Preservation Artisans Guild. Q: Can you tell us a little more about how you got started in your craft? A: I learned to gild from a local egg tempera painter while I was attending PSU as an art major in 1971. She herself had learned to gild from Daniel Thompson, Jr. when she was attending Yale in the 1930s. At that time, he was writing the most recent translation of a 14th-century treatise on the craft of painting and gilding. Her father was a pioneer photographer in New Haven, Connecticut and brothers were both artists. Q: Do you work alone or with a team? A: I have a great team. One of whom, Bradley, has been with me for 9 years! Q: When and where did the art of gilding originate? A: The type of gilding I specialize in was developed in Egypt before 2500 B.C. It is a method used to make an object appear to be solid gold. There are ancient papyrus texts mentioning the “makers of thin gold” as early as 1400 B.C. The methods and materials remain virtually unchanged since the 14th century. 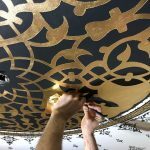 A slightly different technique of gilding on lacquer evolved in Asia. The main difference now is that we are technically able to achieve very, very thin leaves of gold, as opposed to relatively thicker sheets used historically. Q: What do you love about your craft? A: I love seeing the objects that come through the door, meeting the owners, and finding out the history and personal meaning behind the pieces I work on. 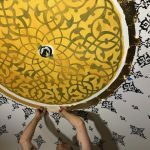 I love the variety of work: from gilding ceilings to gilding Buddhas, to gilding harps and clocks. I like teaching artists and working with foundries as well as with other colleagues. There is never a dull moment. 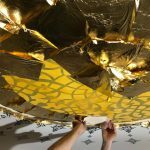 A: Gilding in the methods that we use encompasses all gilding done with gold leaf throughout history. It’s a method of restoration. 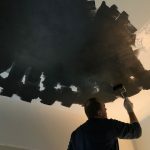 It is the only accurate way to make repairs and also to consolidate or strengthen materials and objects that may have been compromised by water damage. 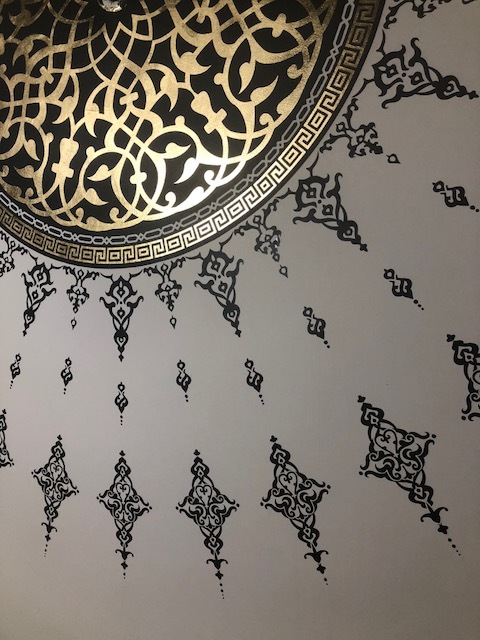 Gilding is arcane and interesting work and although many don’t realize it, gilding actually does exist in our homes today, mostly in the form of picture frames. It is a part of our everyday world, most people just don’t know it. With a little education and information, most people appreciate the craft for what it is. It is time-consuming to do repair work and I am continually impressed that people are willing to invest in the restoration of an object using a finish they had previously had no knowledge of. Q: How do you explain the art and skill that goes into your work to non-craftspeople? 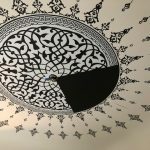 A: I let my clients know, first, that the history of gilding for interior objects is complicated and obscure. 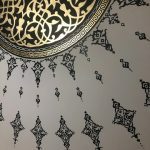 I tell them the methods and materials that were used in their particular object and explain that we will duplicate those techniques using the same material for the areas of repair, matching to the surrounding finish. That let them know that they will still be able to enjoy the original finish and not my interpretation of it. They usually enjoy knowing the history of the finishes. 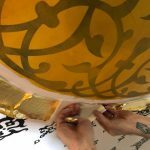 There is a long history of turning a “base” metal into gold and using silver leaf for that purpose, overlaid with a clear colored shellac, which is still the method used today. 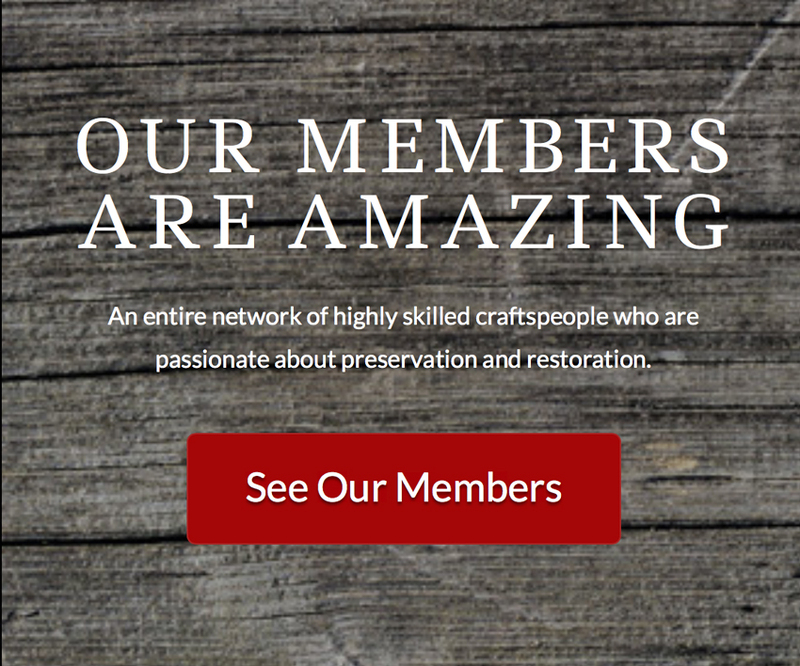 Q: You’re not only a founding member of PAG, but a founding board member – what do you appreciate most about being a member of Preservation Artisans Guild? A: I love the comradery of networking with other highly specialized and skilled craftspeople. 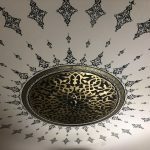 You can connect with Nancy on the Gold Leaf Restoration website, the company Facebook page, and Instagram (@GOLDLEAFRESTORATION). Nancy’s studio is located in Portland, Oregon’s close-in East Side: 544 S. E. Oak Street.